. Last edited 09:29 6 Nov 2018. 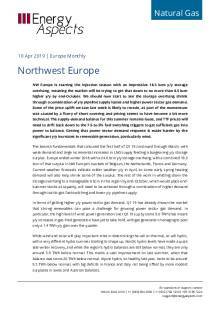 Last week’s cold snap boosted res-com demand and led Northwest Europe to post its first net withdrawal of the gas winter. But the region should return to making a small net stockbuild this week as milder weather and strong LNG sendout offset weaker pipeline supply, easing the supply-demand balance and allowing near-curve contracts to soften. Total European LNG sendout surged by a substantial 2.2 bcm (84%) y/y in October, and we expect LNG sendout to remain the primary bearish supply-side driver in November. Total scheduled port deliveries for Europe are already 0.8 bcm above November 2017's total of 3.2 bcm at 4.0 bcm, and given we are only at the start of the month, plenty more cargoes are bound to be added in the coming weeks. 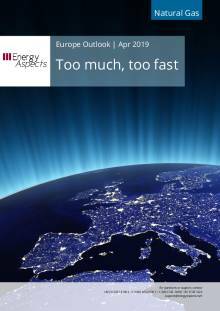 While some capacity holders may opt to build terminal stocks instead of further quickening sendout, some regas facilities—such as in the UK—are already running with high stocks and will be obliged to raise sendout to make room for incoming cargoes. With UK underground gas stocks just shy of capacity and the weather forecast to remain mild, the UK is likely to balance higher sendout by possibly moving to small net exports to the continent. IUK net imports have been limited since early October (keeping the NBP-TTF basis narrow) and we expect that to continue until the weather turns colder later this month. Res-com and power sector gas demand is set to ease. A mild, wet and windy November is forecast in NW Europe and none of that will support power sector gas use. Furthermore, the expected return of some French nuclear plants (outages some 9 GW lighter y/y on average) should further offset the impact of high Belgian nuclear outages. Also bearish for power sector gas demand, the y/y shortage in the Nordic hydro balance has fallen to less than a 10 TWh of stored energy. 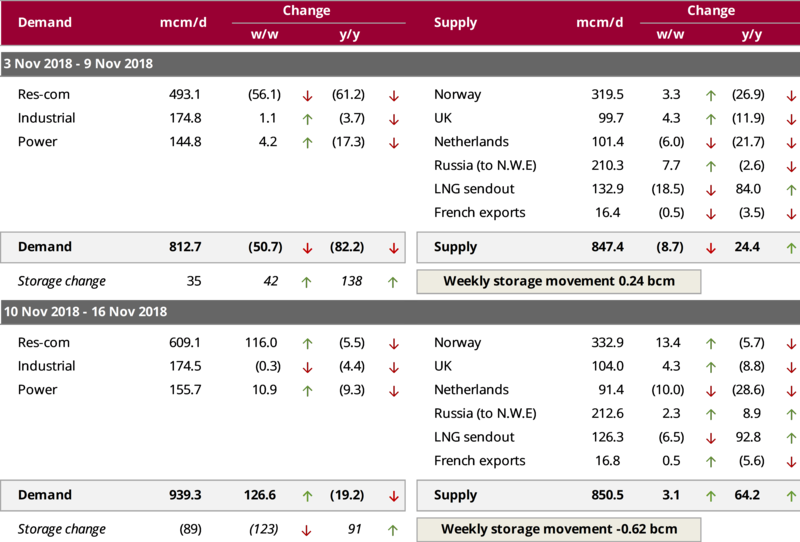 Last week’s net NW European stockdraw was just 0.26 bcm, keeping the y/y storage gap around 1.27 bcm. The gap continued to be centered in Germany (-1.2 bcm y/y) and Baumgarten (-2.03 bcm y/y), with high French stocks offsetting a good part of those deficits. Forecasts for milder-than-normal weather now extending through the first half of November suggest that the remaining NW European deficit will continue to be eroded in the coming weeks. We forecast that NW Europe will make a net stockbuild of about 0.2 bcm in the week to 9 November, compared with a net draw of 0.7 bcm a year earlier. A return to seasonally normal weather the following week should lead to a net stockdraw of about 0.6 bcm, down from 1.3 bcm a year ago. With milder weather and expected stockbuilds in Europe, the outlook is certainly bearish in relative terms. With carbon giving up significant gains, robbing the gas market of further support, the market will likely price down to the lower winter trigger of 23.2 €/MWh. At that level, little weather risk is in those prices, suggesting some upside when temperature outlooks turn.